The Lincoln Barons' Charter Trail is a public art event celebrating 800 years of the Magna Carta. In 1215 the Great Charter was sealed at Runnymede. Lincoln's own Magna Carta is held in Lincoln Castle and is one of four original exemplifications (official copy) remaining. The Lincoln and Salisbury barons will be auctioned in October with money raised going to help The Trussell Trust the national foodbank charity. 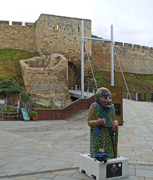 There are 25 Baron sculptures around Lincoln, from 13th June to 13th September 2015. There are another 25 Barons around Salisbury from 12th June to 6th September 2015. Cathedral from 27th June to 12th July 2015. Mooch visited Runnymede in 2011.